❤This 4mm promise ring for her, stainless steel ring, fashion girlfriend ring, engraved jewelry is a perfect piece for any men/women, gentlemen/lady. ❤This valentines ring is made of stainless steel, 18K rose gold plating and engraving at two sides, AAA cubic zirconia, grooved center in silver tone. ❤Small ring Width: 4mm US Size: 5, 6, 7, 8, 9, 10, 11, 12. ❤Come with a fine gift box. Perfect gift for Daily ,Birthday, Christmas Day, Anniversary Day, Valentine's Day and to yourself, wife, girlfriend, husband,boyfriend and lover. ❤Combined with Vintage Classic and fashion ring jewelry, edge comfort fit make you cool and Comfortable, match with suitable apparel for different occasion. Make you charming, elegant and attractive. 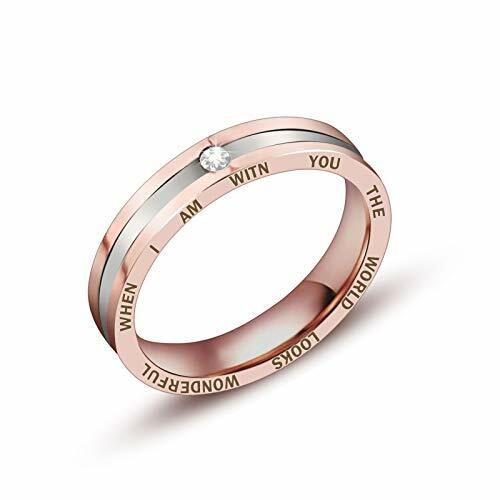 ❤This couple ring is made of stainless steel, 18K rose gold plating and engraving at two sides, AAA cubic zirconia, grooved center in silver tone. Best Materials (316L Stainless Steel),The surface is not easy to change due to the environment, long-term wear without losing the original metallic shine of the product ,Never fade, keep shiny, Without any feeling of discomfort, Anti-allergic materials. ❤Fall in love ring band Width: 4mm US Size: 5, 6, 7, 8, 9, 10, 11, 12. ❤Come with a fine gift box. Perfect gift for Daily ,Birthday, Christmas Day, Anniversary Day, Valentine's Day and to yourself, wife, girlfriend, husband,boyfriend and lover. ❤Dec.bells is committed to provide high quality fashion jewelry and the best services to our customers. if there are any problems with the purchase, please feel free to contact us, we will try our best to help you. If you have any questions about this product by Dec.bells, contact us by completing and submitting the form below. If you are looking for a specif part number, please include it with your message.